What Are the Benefits of Black Dates? When was the last time you ate dates? If you're on a diet or trying to keep your calories in check, they might not be your first choice. Despite their high sugar content, however, black dates are good for you. They're chock-full of fiber, minerals and phytochemicals that fight disease and support your health. Use black dates instead of sugar in your favorite recipes to boost your antioxidant intake and stay full longer. The date fruit comes from Phoenix dactylifera, also known as the date palm. People have been using its fruits, leaves and stalk for thousands of years. Dates are naturally sweet and come in a variety of shapes, colors and sizes. Sugar accounts for about 70 percent of their content. Black dates also contain small amounts of vitamin A, vitamin E, vitamin K, B-complex vitamins, calcium and phosphorus. They are a good source of zeaxanthin, lutein, tannins and other polyphenols that neutralize free radicals and protect against oxidative stress. With their sweet flavor, these fruits can replace sugar in most recipes. Compared to most fruits, dates are higher in sugars and carbs. Bananas, by comparison, have 24.9 calories, 6.4 grams of carbs and 3.4 grams of sugars per ounce. The same amount of papaya boasts 10.9 calories, 2.7 grams of carbs and 1.7 grams of sugars. However, this doesn't necessarily mean that black dates contribute to weight gain. It all comes down to how much you eat. What matters is your total calorie intake. A diet rich in fruits can actually make weight loss easier, according to a 2016 review published in the journal Nutrients. The key is to enjoy these foods in moderation. Read more: Are Dates Good for Weight Loss? According to the Nutrients review, fruits may help prevent obesity and weight gain despite their high sugar content. These foods have been shown to positively alter gut flora, increase satiety and reduce total calorie intake. Most fruits, including black dates, are high in water and fiber, which helps suppress appetite. Additionally, they're lower in calories than processed foods, making it easier to lose weight and keep it off. These delicious fruits are a healthy substitute for sugar and artificial sweeteners. Over the past several years, they have become a favorite choice for raw foodists. 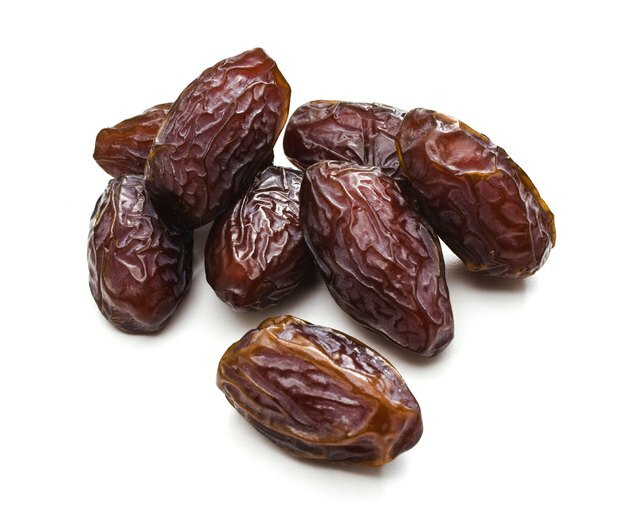 Most date varieties, including black dates, are widely used in raw energy bars, raw vegan brownies, raw cocoa bites, raw macaroons and other homemade desserts. You can eat them raw, stuff them with cacao nibs or crushed nuts, enjoy them as a pre-workout snack or marinate them. Think about the benefits of dates rather than their sugar content. When consumed in moderation, these fruits are unlikely to cause weight gain. A 2016 review published in the Journal of Ethnopharmacology highlights their antibacterial, anti-inflammatory and antioxidant properties. According to researchers, the date fruit and syrup are rich in carotenoids, tannins, polyphenols and other bioactive compounds with therapeutic properties. A 2015 study featured in the Journal of Ayurveda and Integrative Medicine found that date palm fruits may slow the progression of Alzheimer's disease and improve memory. The polyphenols in these fruits can lower your risk of developing Alzheimer's and enhance your learning ability. The date fruit has been also shown to reduce stool ammonia levels, stimulate bowel movements and cause positive changes in the microbiota, which in turn, may help protect against colon cancer. Are you struggling with bloating, constipation and poor digestive health? Black dates might be exactly what you need to feel your best again. Rich in fiber, these fruits support colon health and increase the number of good bacteria in your gut. At the same time, they inhibit colon cancer cell growth, according to a 2014 study published in the Journal of Nutritional Science. Dietary fiber not only keeps your digestive system running smoothly but also reduces blood sugar and cholesterol levels. Furthermore, it curbs hunger and fills you up quickly. Today's Dietician points out that eating high amounts of fiber can reduce appetite by up to 5 percent and food intake by 10 percent. Black dates are rich in sugars, but they also contain fiber, which slows sugar absorption into the bloodstream. Looking for a pre-workout formula that actually works? Eat a handful of black dates instead. The sugars in these fruits will boost your energy and stamina, getting you ready for a tough workout. Plus, dates contain no additives, preservatives or artificial flavors. Most pre-workout supplements are made with caffeine, which may affect your sleep. Some people are sensitive to this ingredient and may experience jitters, increased blood pressure, palpitations and digestive distress. Others are allergic to caffeine. In their case, drinking even small amounts of coffee, tea and other beverages containing caffeine may cause rashes, hives, swelling of the face and itching. Sure, not all pre-workout formulas contain caffeine. But why spend money on these products when you can get your energy from fruits? Black dates are higher in simple carbs than bananas, apples, oranges and other fruits, so they will energize you instantly. Dates are particularly beneficial for the brain, according to a 2016 study published in Neural Regeneration Research. These fruits boast high doses of ferulic acid, caffeic acid, vanillic acid and other antioxidants that may prevent age-related diseases and cellular damage. Scientists have found that date consumption reduces inflammatory markers, delaying the formation of senile plaques in the brain. Due to their high antioxidant levels, these fruits protect your brain from oxidative damage and may help prevent neurodegenerative diseases. The benefits of dates don't end here. These fruits not only keep your brain sharp and boost your energy levels but also support bone health. They're rich in calcium and phosphorus, two minerals that help strengthen your bones. According to a 2016 research paper in PLOS ONE, these nutrients may help increase bone mass and structural strength when combined with regular exercise. Mice that engaged in a long-term exercise program while on a diet supplemented with calcium and phosphorus experienced a greater increase in bone strength and tibial tissue mineral content compared to nonexercised mice. These minerals regulate bone growth and mineralization and may help prevent fractures in the long run. Without a doubt, black dates have their place in a balanced diet. Portion control is the key, however. Replace your daily cookies and other processed snacks with dates to reap the benefits. Ideally, eat these fruits before hitting the gym so your body can use the extra sugar for energy. Medical News Today: What Is a Caffeine Allergy? What Is the Nutritional Value of Dates?